Welcome to the Labyrinth of Peace Site. 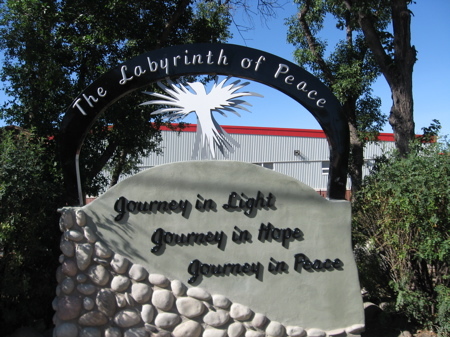 This beautiful sign decorates the south side of the labyrinth. It repeats the invitation for all to “Journey in Light, Journey in Hope, Journey in Peace”. • It is wheelchair accessible. For your own personal journey please follow this link to download the meditations and music. If you need help click on “Labyrinth MP3 downloads” from the pages listed in the left margin. It will walk you through it. This entry was posted on Thursday, November 4th, 2010 at 1:18 pm and is filed under Welcome. You can follow any responses to this entry through the RSS 2.0 feed. You can leave a response, or trackback from your own site.